This was supposed to be my review of BarCampMilwaukee6, with all the usual comments on what I learned, what I shared, and how much fun I had with the always-unique band of BarCampers. Only problem is that I missed it, for the first time. Like 225,000+ other Brewer fans, I tossed my name into the virtual hat to get what limited seats might be available for a playoff game at Miller Park. Astonishingly, I was one of the 5500 names selected to buy tickets for the Division Series. At the time, nobody knew when the games would be, so there was a chance that BarCamp wouldn’t be affected at all. But I had a plan, just in case the games were on the weekend: I’d buy tickets for the Sunday game, and go to BarCamp Saturday. When the time came to actually login and buy the tickets, the Virtual Waiting Room was not kind to me. By the time I got through, there was just standing room available for Game #2. Didn’t want to spend $25 to walk around the ballpark, so I dropped out. What I didn’t know at the time was that my brother-in-law got tickets for Game #1. After he offered me one of his tickets, I was on Plan B: I’d see baseball on Saturday, and go to BarCamp Sunday. This is what happened last year, when I went to the Farm Aid show at the same location. This would be fine. Until Thursday. I was working hard when I got a call from my boss’ boss. This sort of thing never happens. Any worries I might have had about the subject of the call were dissipated early. The CEO was wondering if I might be interested in using his tickets to the Packer game Sunday. For a multitude of reasons, I said ‘yes.’ I was immediately glad I didn’t get those Sunday baseball tickets. But now what? Plan C goes into effect: Baseball Saturday afternoon, BarCamp in the evening (I could forego the Badger game), Green Bay on Sunday. 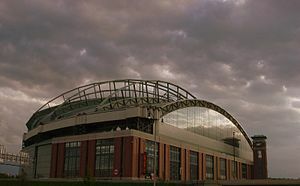 We had a great time at Miller Park Saturday afternoon. What I was not expecting was that my back would suddenly start acting wacky the instant I came home from the ballpark. I literally could not get out of my chair without great pain. So I was hosed. With several big doses of ibuprofen and a long car ride to Green Bay, I somehow managed to make it through the football game too. It was my first time at the Temple of (American) Football, and it was certainly unforgettable. But I felt pretty bad about missing my favorite (un)conference. This will be different next year. Anyway, if you’d like to see what we all missed, here’s the schedule. If you went to BarCamp, please share some highlights in the comments. Feel free to denounce me for my wicked choices too. Have you ever had a conflict between two or more events that you had major passions for? How did you resolve it? Was it the right decision? Comment below. One more thing: GO BREWERS!! BarCampMilwaukee6 Just Two Weeks Away! Have I mentioned this lately: I love conferences! There’s not much better times than the opportunity to get together with folks of like interests, like mind and similar skills, get away from the day to day and schmooze. Occasionally, even learning takes place. For serendipity and wide-ranging topics, few conferences beat the ones falling under the BarCamp umbrella. A week from Saturday (October 1), BarCampMilwaukee 6 opens at Bucketworks on South Fifth Street in Milwaukee’s Walker’s Point neighborhood. If you happen to be within traveling distance, you should come. You will meet fabulous people, eat marvelous food, play with assorted ideas and toys,and probably get a t-shirt too. For the second year, there will also be KidsCamp, which should be great fun. As always, there will be robots, too. Did I mention it’s all free of charge? Unless, of course, you want to make a donation. You can peruse the Conferences and such category here to learn more about all six versions of BCMKE. Register for BCMKE6 at the site. Watch this space for further reminiscing. And speaking of conferences, watch this space too for some WordPress news. With August upon us, can the first weekend in October be far behind? This week marked the launching of the new, Drupal-based BarCamp Milwaukee 5 site and the traditional self-organization of the untraditional tech unconference has commenced. My goodness, in four days there are already almost 30 proposed sessions (of course, by the time you click that link there are likely to be even more!). BarCampMilwaukee is truly my favorite weekend of the year, and it’s a little hard to believe I’ve been to all of them. I could reminisce endlessly about stuff I’ve learned and fun I’ve had, but I’ll hold off on that (for now, at least). Since my man Gabe has already given the reasons you (or your company) should sponsor BCMKE, today I want to give you a few reasons why you should plan to come. You want to learn something. Take a look at those sessions again. If you’ve got curiosity about any of them, the people who are presenting are passionate about their subject(s), and probably know as much as anyone on the planet about that. If you’re curious about some topic that isn’t on the list yet, put it on the list (sooner, rather than later). Chances are somebody else either knows enough to put a session together, or perhaps a bunch of people with a similar curiosity can help you research the topic so you can all learn together! You want to share something you’ve learned. I’ve been working with open source software for so long, it’s almost second nature to want to help others learn what I know. BarCamp is one of those places where you can do that without having to know everything about your topic. You can comfortably stand on the shoulders of giants here. You want to improve your social skills. Whether it be that fear of public speaking (see above), or that gnawing feeling that you have been collecting Facebook friends that you’ve barely met. Conversations start pretty easily at BarCamp. You want to hang out with the cool, smart kids. Whether your social skills are polished or not, BarCamp is a place to meet all sorts of interesting people in a very non-intimidating space. You want to meet some of your favorite bloggers. Not just me, though I’ll be there too. There’s lots more reasons (did I mention it’s FREE! ), but all I have time to write about now. Go and register now, and I’ll see you October 2-3 at Bucketworks!